At 3:50pm today, Minister of Health Simon Harris tweeted: @TerFlanagan @EndaKennedyTD @an_saol @reinhardschaler am looking into this and will be back in touch with @an_saol. But this was just one of many good news today. 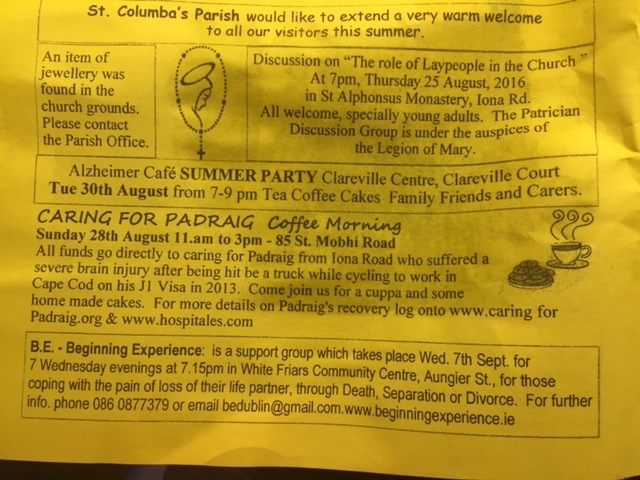 Another piece of good news was that Pádraig went, for the first time since his accident, to the cinema, the pictures, to watch a movie. In 1991, Arnold Schwarzenegger was paid $15 million to star in Terminator 2: Judgment Day, a movie where he only speaks 700 worlds in 137 minutes. That’s roughly $21,429 per word. Earlier this year, everyone slowly realized that Henry Cavill’s Superman had very little to say in Batman v Superman: Dawn of Justice, even though his character’s name was in the title. He only has 43 lines of dialogue in the whole movie. So the news that Matt Damon apparently only speaks about 25 lines of dialogue in the upcoming Jason Bourneisn’t completely out of the ordinary. Heroes who speak little and let their actions do the talking for them have been staples ever since Clint Eastwood put on a cowboy hat and squinted his eyes at the desert heat. So just go ahead and consider this your cool trivia of the day. The Three Amigos are getting ready for their big An Saol Fundraising cycle from Hollywood to Napa in October. We’ll be posting some footage soon about how we’re getting on with the preparations. Are you curious?